The long wait for new episodes of BBC's Sherlock is almost over, with the network announcing today that the Sherlock Season 4 premiere will air on New Year's Day, Sunday, January 1. The episode will be available for fans in the U.K. on BBC, and for U.S. fans on PBS Masterpiece on the same day. 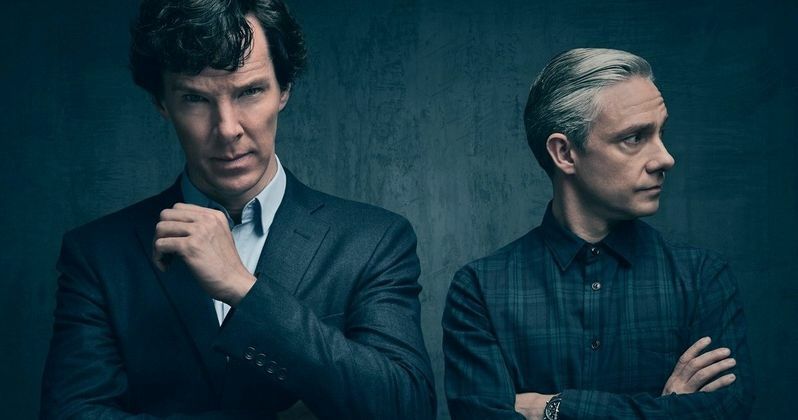 The network also released an intriguing teaser image, although it unfortunately doesn't give us a new look at Holmes (Benedict Cumberbatch) or Watson (Martin Freeman). BBC announced the news on Twitter, revealing the episode will be entitled The Six Thatchers. There are already theories that the title could be a reference to the Sir Arthur Conan Doyle story The Adventure of the Six Napoleons, which was published in 1904, where the duo investigated a number of crimes related to broken statues. It's possible this new story could swap out the French military leader for the Great Britain Prime Minister Margaret Thatcher, but no official plot details have been given for this episode yet. Fans got their last fix of Holmes and Watson in the Christmas Special The Abominable Bride, which was the most watched program over the holiday season with 11.6 million viewers and the highest-ever audience share for a Sherlock episode. The special, which transported Holmes and Watson to Victorian Era England, was also released in thousands of theaters around the world to complement the TV broadcast. During the show's Comic-Con panel, a new trailer was released that revealed Holmes and Watson have returned to present day. Promising laughter, tears, shocks, surprises and extraordinary cases, Season four will begin with the nation's favorite detective, the mercurial Sherlock Holmes, back once more on British soil, as Doctor Watson and his wife, Mary, prepare for their biggest ever challenge - becoming parents for the first time. The series recently confirmed that Toby Jones has joined the cast for the second episode in this new season, which will consist of three 90-minute episodes. The first of the three feature-length episodes in Sherlock Season 4 will be directed by Rachel Talalay, who has worked as a director, producer, and professor in film and television for more than 25 years, having previously directed Doctor Who, The Flash and The Wind in the Willows. Nick Hurran will direct the second episode. Sherlock is written and created by Steven Moffat and Mark Gatiss, and inspired by the works of Sir Arthur Conan Doyle. Take a look at the new teaser image for Sherlock Season 4, as we get ready for the January 1 premiere date.